This is stash report # 52. The last one for this year. When I look back on them, I'm definitely glad I kept track. I know I would have purchased more fabric and probably have used less if I hadn't. I can honestly say I'm surprised at how much I still ended up buying and am even more surprised at how much I really did use. It was an eye opener. I've been thinking about my goals for this new year, but before I share them, I want to finish this last report. 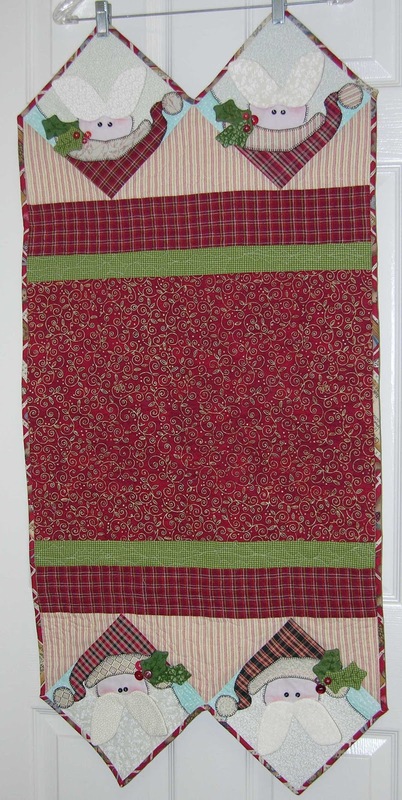 The Fat Quarter Shop had the 12 Days of Christmas sales leading up to Christmas Day and Mr. Quilting Bug let me order those items I wanted as part of my Christmas present. First off, I got 6 yards of this beautiful metallic batik at half price. I don't have a purpose in mind for it yet, but there's enough here for borders on a large quilt or as a backing. I also got 7 jelly rolls from them on Christmas Eve - 3 Maison de Garance, 3 Lumiere de Noel and 1 Breakfast at Tiffany's. I would love to make a quilt for our King size bed using the Maison de Garance and the Lumiere de Noel jelly rolls. I bought 3 of each because I figured that would be plenty for such large quilts. I also got a gift certificate there from my brother and I used it to purchase 15 yards of Moda Bella Solids in Snow. 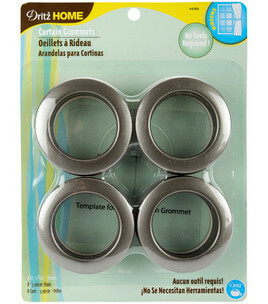 This is a great staple to have in my stash for all types of projects and I know I'll love having it on hand. My sweet mother-in-law gave me a gift certificate to JoAnn's and I used it to supplement my stash with other basics. I bought 7.75 yards each of Kona Cotton in White, Black and Bone. I've already washed and pressed all of this fabric and have it sitting on bolts in my sewing room. And that ladies and gentlemen is basically what 63.5 yards of fabric looks like - minus the picture of the Snow Bella Solid because that hasn't come in yet. Now comes the part where I have to admit that I used no fabric this week. I had hoped to have another quilt quilted by today, but it just didn't happen. Boy, this week really killed my net used totals for the year. But that's OK. Tomorrow wipes the slate clean again. I have some new goals for my stash in 2011. Buy no more than 150 yards of fabric the whole year. This equates to 12.5 yards each month and would be less than half the amount of fabric I bought in 2010. Concentrate almost exclusively on my UFO's, starting out with those that are already kitted. If I do that, then my first goal should be pretty easy because the quilt kits contain all the fabric to make the quilt except for the backing. Get these quilts quilted! I have far too many quilt tops waiting to be turned into finished quilts. Whenever the need arises, drop everything and make a prayer quilt. It's important to have priorities and God's calling is the highest. I'd also like to make several quilts for charity whether for woman's shelters, orphanages or soldiers. Wherever there's a need. But I plan to use the fabric in my stash for the bulk of these. I have some more specific goals on some of these things, but figure this is enough detail for here. I'm not setting a goal for how much fabric I want to use, because that number's not really that important to me. It'll sure be interesting to see how this next year turns out. "This service that you perform is not only supplying the needs of God's people but is also overflowing in many expressions of thanks to God"
Well, I'm sure it's not the last package I'll ever send her, but it is the last one of this year. I've managed to send/give her a quilting related package every month this year. This package includes supplies to finish a couple of things for her. I traced the last 3 blocks for the Winter Wonderland quilt for her. 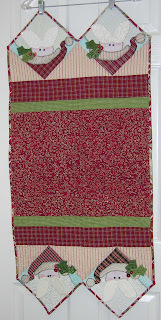 For Christmas, I bought her all the fabric she should need to make the pieced blocks and borders for this quilt too. All in shades of blue of course. For this last package, I included block 12 of the Imperial Splendor block of the month. She's been keeping up with them pretty wall and should be ready to assemble the quilt after making this block. To that end, I also included the setting kit for the quilt as well as enough fabric for the backing and binding. It's a pretty generous sized quilt and finishes around 80" x 100" I think. 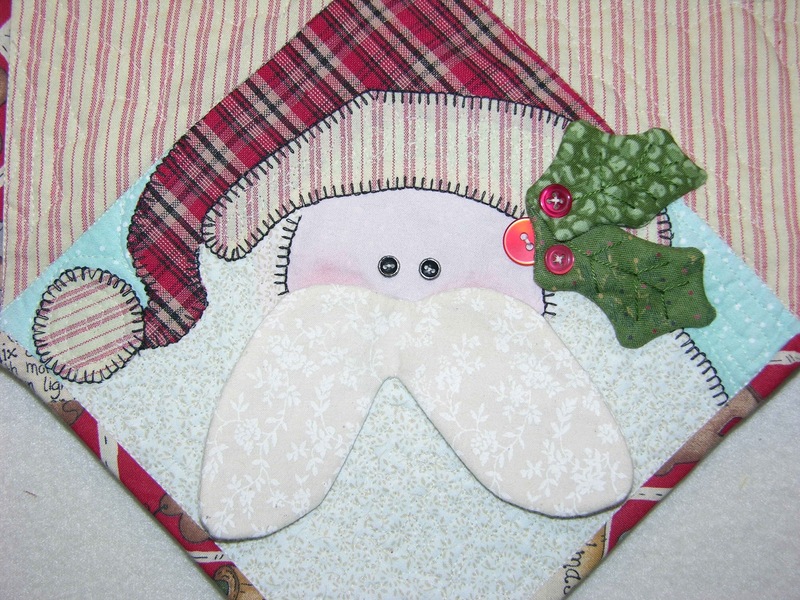 I also included a book called "Learning to Machine Quilt" by Pat Sloan, a snowman ornament and a photo calendar. I printed out personal photos for each month and taped them inside. There's still one more item from last month that I'm trying to finish up and mail to her. Hopefully, I'll finish it before the start of the new year! As she finishes up her quilts, I'm sure I'll share the pictures here as I'm just so proud of her and happy that she's taken an interest in quilting too. I love you Mom! "A cheerful heart is good medicine, but a crushed spirit dries up the bones"
Gabriel somehow fooled Santa into believing she was a good girl this year. She got a plethora of treats and new squeaky toys, including this cow that has 16 squeakers in it. Can you say doggie heaven? "A heart at peace gives life to the body, but envy rots the bones"
I'm sure I'm not the only one to have their Christmas plans derailed by mother nature this year. It snowed for the fourth time this month on Christmas Day. The last time it snowed here on Christmas Day was in 1947 before either myself or Mr. Quilting Bug were even twinkles in our parent's eyes. We got 8 inches of snow and our plans to visit my family for Christmas were postponed. I'll drive down to see them tomorrow, but because of work and other responsibilities the whole family won't be able to get together now. It's so beautiful when it snows, but I sure hope we don't get a lot more of it this winter. Is it too early to be looking forward to spring? "A fool gives full vent to his anger. But a man of understanding controls himself." And during this season of family and togetherness, Gabriel has also been joining in. Somehow she's talked Mr. Quilting Bug into letting her up on the couch on special nights. This is how the birth of Jesus Christ came about: His mother Mary was pledged to be married to Joseph, but before they came together, she was found to be with child through the Holy Spirit. Because Joseph her husband was a righteous man and did not want to expose her to public disgrace, he had in mind to divorce her quietly. But after he had considered this, an angel of the Lord appeared to him in a dream and said, “Joseph son of David, do not be afraid to take Mary home as your wife, because what is conceived in her is from the Holy Spirit. She will give birth to a son, and you are to give him the name Jesus, because he will save his people from their sins.” All this took place to fulfill what the Lord had said through the prophet: “The virgin will be with child and will give birth to a son, and they will call him Immanuel”—which means, “God with us.” When Joseph woke up, he did what the angel of the Lord had commanded him and took Mary home as his wife. But he had no union with her until she gave birth to a son. And he gave him the name Jesus. So now that Christine has received her package from me, I can finally share pictures of it. 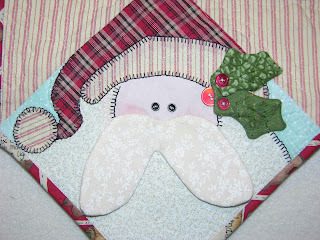 This is what I made for her for the Nancy Halvorsen/Christmas challenge. This challenge is the most recent in a series of ongoing challenges for a group called 'The Twelve of Us'. I made her 2 tea towels - the top one that says 'Bless Ewe' and another one with a dove in a tree. I've looked through my pictures but can't find any closeups of them. I finished them quite a while ago and thought I'd taken individual pictures, but if I did, I don't know what happened to them. I should have put a quarter next to them so you could an idea of the scale of them. Each figure is probably about an inch tall. These were some teeny tiny pieces to cut out and I couldn't have done it without my tweezers. I was really pleased with how it turned out although I won't be quick to try it again. I spent probably 5 or 6 hours making those people. Nancy Halvorsen makes some very cute and whimsical designs. I think all of her things have a very distinctive look to them. Considering this was actually Christine's project choice, I wanted to make her something she would hopefully like. The patterns for the stitchery and tea towels are in the book 'Tidings'. All of the fabric in this wall hanging are the same as those in the book. I also included all of the leftovers in her package as well. I only needed a small amount of most of the fabrics so there was quite a bit left. Considering she likes her work so much, I'm hoping she can use them for other projects too. So now on to the next project - Quilted Greeting Cards. This is yet another project I've never tried. "Give yourselves completely to God - every part of you ... you want to be tools in the hands of God, to be used for his good purposes." Only 4 more reports after this one ! I'm already starting to think of some goals for next year. Like how about buying NO fabric all year... Nahh! I know there's zero chance of that happening. But seriously I would like to set some realistic goals. I'm still pondering and have a few weeks to prayerfully consider it. This report will be short and sweet. To begin with, this was another week where I bought no fabric. I'm now at 18 out of 48 weeks (or 37.5%) where I didn't purchase any fabric. That's up from 35% 6 weeks ago. My big finish this week was the Charmed, I'm Sure quilt. It's been quilted and bound and is ready for it's new home. I used 5 yards for the backing and binding on this one. I used another yard of fabric as the background for my mom's Winter Wonderland stitcheries. And basically, that's it. "He who supplies seed to the sower and bread for food will also supply and increase your store of seed and will enlarge the harvest of your righteousness"